Jef Sturm’s artistic journey began with encouragement back in Akron, Ohio, from his grandmother, Margaritte Orman, who was handy with crafts and played the piano. He attended a vocational high school where he took art for four periods every day, and Sturm was further encouraged by his commercial art instructor, Abby Nelson. She helped him build a portfolio, and the young artist was accepted at the Cleveland Institute of Art. In Cleveland Sturm struck up a friendship and mentorship with his sophomore design instructor, the late John Paul Miller. After college Sturm and a friend opened their own graphic design and advertising business, but “We weren’t really mature enough to be doing it.” That business closed, and the artist went home to Akron and got a job with a design firm he dreamed of working with when he was in high school: Smith, Scherr & McDermott. He learned a lot there. After four years at that job, he spent a few more years as the graphics coordinator for the City of Akron. Then came another stint with a graphic design business, followed by two years teaching graphic design at the same vocational high school he attended in the 1950s. In 1976 he again opened his own business, Jef Sturm Graphic Design, which he operated for two decades and experienced many technological advances that made his work much easier. Jef enjoys having more time to concentrate on painting. He likes impressionism since those artists paint “reflectively,” he says, meaning that the light and colors are picked up in a way to “get you that wonderful impressionistic look.” He also likes the Baroque period, and artists including Rembrandt and Fantin-LaTour. Jef’s painting of The Prodigal Son will be auctioned off on Friday, October 20, 2017 at the annual Goat Island Yacht Club Regatta. 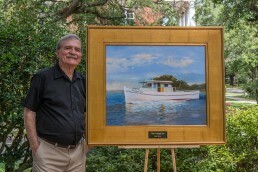 His work will also be featured on posters and T-shirts, which will be available for purchase at the SC Maritime Museum in Georgetown starting on August 11, and at the Wooden Boat Show scheduled for Oct. 21-22 at the Georgetown waterfront. 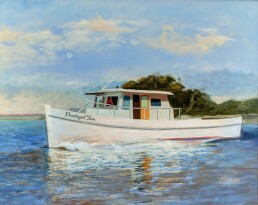 The artist teaches his methods on Mondays in Litchfield for the Coastal Carolina Lifelong Learning program. On Tuesdays he’s at The Market Common’s Seacoast Artists Gallery in Myrtle Beach, and on Fridays he drives up to Calabash in North Carolina to teach life drawing. Most of his students are retired, and Sturm has advice for them as well as for young artists wondering what steps to take to make art a career. Other works by Judy Maring are on display and available for purchase at Coffee Break Café, Waterfront Books, Townhouse Restaurant and Georgetown Art Gallery, which are all on Front Street just a few steps away from the museum. The South Carolina Maritime Museum, at 729 Front St. in Georgetown, South Carolina, is home to the prized Fresnel lens of the old North Island lighthouse. Its exhibits and artifacts are entertaining, illuminating and interactive. The museum is open from 11 a.m. to 5 p.m. Monday-Saturday, and the phone number is (843) 520-0111.